Russian infantry rifle Model 1930G, carbine 1938G and 1944G. Mosin-Nagant Carbine Model 1944G with bayonet in fixed position. 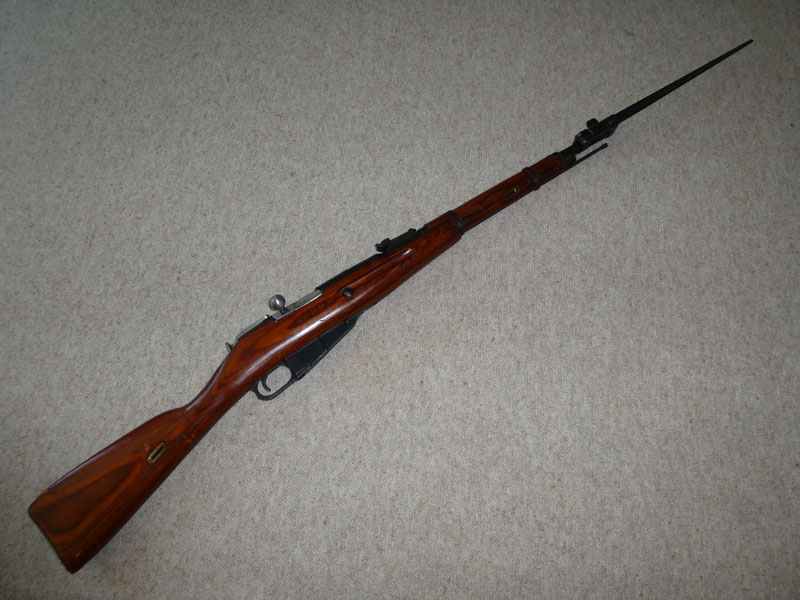 The Model 1930G (sometimes called the 1891/30) is one of a series of rifles based on the Mosin-Nagant Model 1891 and which formed the standard rifles of the Russian Army until 1945. The title ‘Mosin-Nagant’ commemorates the original design, basically that of the Belgian Nagant brothers with modifications due to Colonel S. I. Mosin of the Imperial Russian Army. Its turnbolt action is much the same as any other, though the three-piece bolt is an unnecessary complication, probably adopted in order to avoid difficulties with the myriad rifle patents in force at that time. An unusual feature of the design is the provision of a cartridge control catch. One of the difficult problems of weapon design is the efficient feeding of rimmed cartridges from a magazine; the pressure of the magazine spring tends to jam the rims together and give rise to stoppages. The Mosin-Nagant used a spring-loaded latch, controlled by the operation of the bolt, to hold down the second round in the magazine and thus take pressure off the top round so that it could be easily loaded into the chamber by the closing bolt without the danger of the rim of the second round interfering due to the upward pressure of the spring. Russian Model 1944G carbine with bayonet in fixed position. Firing the Mosin-Nagant Modell 1944 carbine. Mosin-Nagant carbine (below) with Ammo Box (left). On the top right for comparison, a US Marlin carbine from the end of the 19th century. 3D model of Mosin-Nagant Model 1930G rifle. The original 1891 model was a ‘long’ rifle, and was always used with its bayonet attached. It was partnered by a slightly shorter weapon, known as the ‘Dragoon Rifle’, but this was by no means as short and handy as the contemporary carbines in use by other armies. In 1931 the Soviet Army introduced the 1930G which was more or less the Dragoon Rifle with improved sights and with the design somewhat simplified so as to make production easier. It became the standard infantry rifle and remained so throughout the war, although it was widely supplemented by the later model of carbine and, of course, by the ubiquitous sub-machine guns PPSh and PPS which were a lot cheaper and quicker to make. Numbers of the Model 1891/30 were fitted with sighting telescopes for use by snipers. Carbine 1938G: Originally intended for mounted troops, this was the same basic pattern as the 1930G rifle but with the barrel shortened to 20.45in. Carbine 1944G: This was almost identical to the 1938G but with the addition of a folding cruciform bayonet attached to the muzzle. This, if it did nothing else, simplified the problem of what to do with it when it wasn’t on the alert, a problem which often puzzled Russian recruits since bayonet scabbards were never a standard Russian issue item. Video from shooting with the Mosin-Nagant Model 1944 carbine.